I related to the main character in Don’t Touch more than I’d like to admit. Cadence Finn, Caddie for short, is a junior at a school for the arts. That part is pretty average, anyone could relate to that. She is there because she wants to pursue actin as a career. Her parents just separated and she fears their divorce. Now here’s where things get sticky: Caddie thinks that if she never touches another person’s skin her parents could possibly get back together. Now, this thinking is crazy, but so is Caddie. Most people would probably say they see some of themselves in her. She has awful anxiety, she gets panic attacks, and she needs to feel in control or she freaks out. All these things put together make for a difficult case. Also, the intensity of Caddie’s problems is what makes her feel crazy, but so many people have anxiety and worries similar to her. I loved the romance in this story, not despite the fact that Caddie couldn’t have a physical relationship, but because of it. Peter, the boy she spends 400 pages falling in love with, is tortured by the way Caddie acts. Until he finds out that he isn’t the reason she doesn’t want to get physical, he’s offended. It takes a while, but when Peter finally comes to terms with being a supportive figure in Caddie’s life, they are so sweet together. Multiple times their gaze is described as being just as powerful and amazing as touch, if not more. This shows just how meaningful a relationship made of talking and spending time together can be without physical touch. Not once was I bored while reading this book. There were so many connections between Caddie, and her character in the play her school was putting on, Ophelia. Twice there were parts where I thought Caddie was going to drown herself. The psychology was spot-on and the friendships and denial seemed so real. I had no doubt that this could’ve been non-fiction. I 100% recommend this book to everyone. 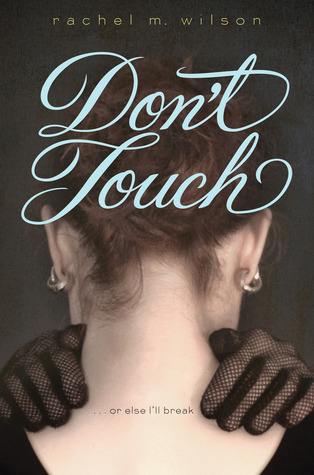 Don’t Touch is definitely one of my favorites and I can't wait to read more by Rachel M. Wilson.